The Office of Open Records (OOR) is required by Pennsylvania’s Right-to-Know Law (RTKL) to “develop a uniform [request] form which shall be accepted by all Commonwealth and local agencies” (Section 505(a) of the RTKL). 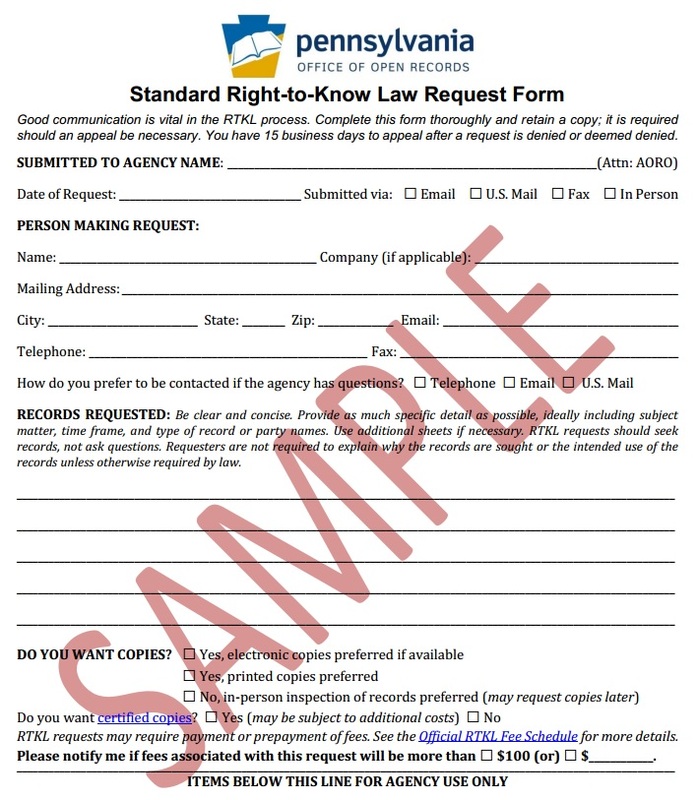 The new Standard RTKL Request Form reflects great input from both agencies and requesters. We asked for your thoughts back in September, and you came through. Thank you to everyone who offered suggestions. We weren’t able to incorporate every idea, of course, but we did incorporate many. We hope and expect that the new form will be significantly more useful for everyone involved in the RTKL process. As required by Section 505(a) of the RTKL, all Commonwealth and local agencies must accept RTKL requests submitted on the new Standard RTKL Request Form, as well as requests submitted on previous versions of the Standard RTKL Request Form. We’ve developed a draft update to the Standard RTK Request Form and we want to know what you think. The goal is simple: Improve the form by making it more useful and easier to understand for both agencies and requesters. Please take a look at the draft update, compare it to the existing form, and share any comments or suggestions by Sept. 30, 2018. Note: When the update is finalized, the PDF version of the form will be a fillable PDF, just as the current form is. The draft version does not include that feature. Pennsylvania’s Right-to-Know Law gives the Office of Open Records the duty to “develop a uniform [request] form which shall be accepted by all Commonwealth and local agencies” (Section 505(a)). The OOR’s standard Right-to-Know request form hasn’t been updated since 2013. We’re now in the process of reviewing and updating the form — with the goal of improving it by making it better for both requesters and agencies. If you have any thoughts or suggestions on how to improve the standard RTK request form, please share them with us. We’d love to hear from you.